For the first time in a while I have my bullet journal ready with at least a week before the month begins. 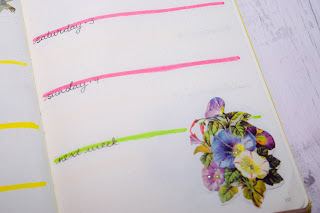 This month I have a collage floral theme going. I was inspired by some flower cut outs I bought in Tiger about a month ago. They looked like scraps from card making or something, but I thought they were so pretty and had to do something with them. 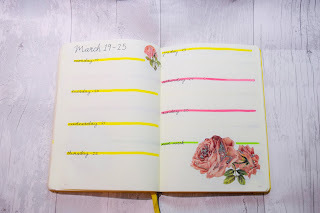 And so with the busy schedule at the moment it was a bittersweet opportunity to do an 'easy' but still pretty set up for March. 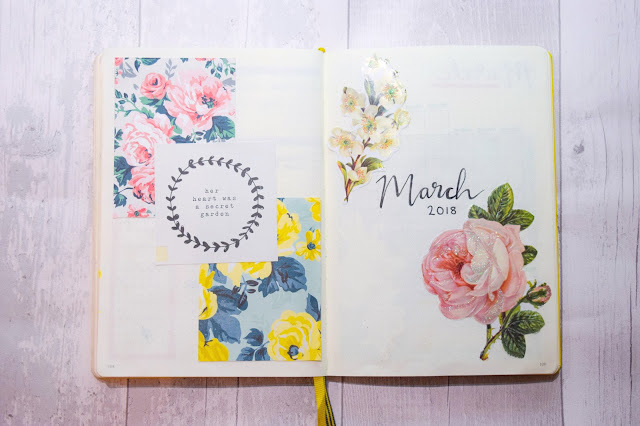 I really like the title page and it quickly sets the colour scheme for the month of March. 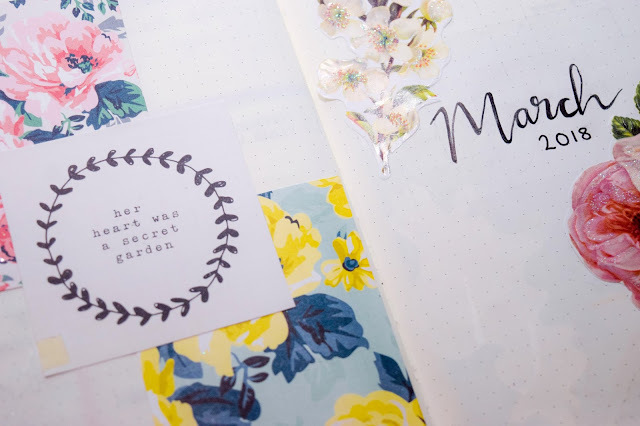 The other day when I was in Hobbycraft, I picked up these cute paper sheets which had a simple floral design on one side but on the other had a bunch of floral designs and quotes. 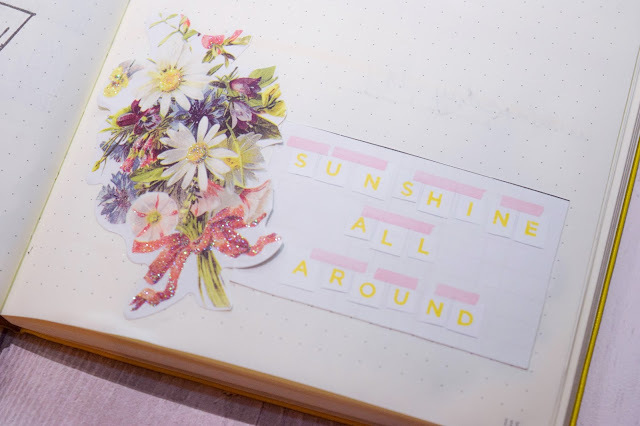 I cut it up and decided to use it in my journal this month along side the floral cut outs to add a bit more colour and a modern-y look to it. I think it all works pretty well together to be honest. 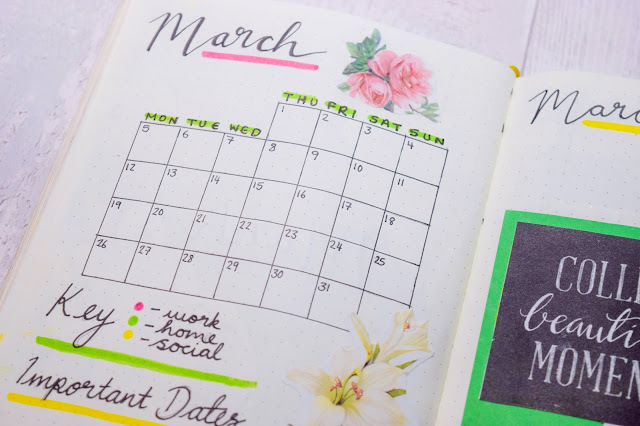 I really like this monthly overview. 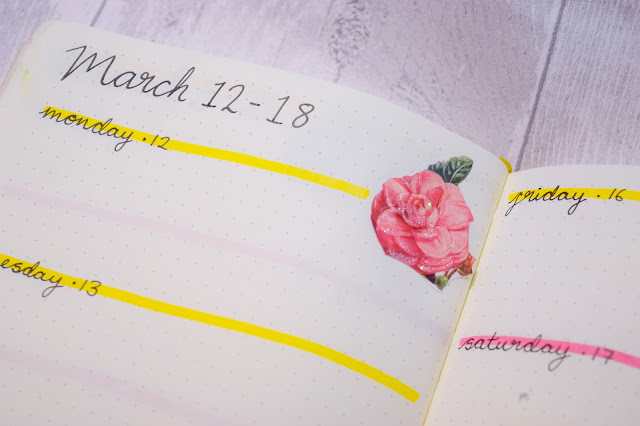 I kept the small calendar layout that I had last month and also because I used the key and found it worked really well for me, did this again for March. 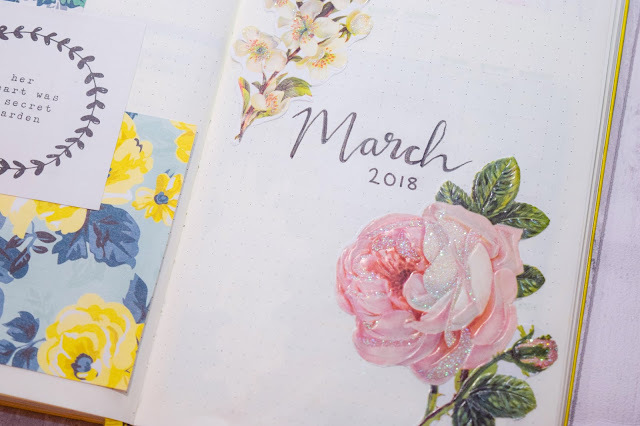 I also used the little envelope to put February memories in and liked that too so I thought I'd do something similar for March by having an open pocket to slot things in. So if I do something and have a ticket, I'll put it in and I've even been putting in the timetables I write for myself in my February one because they hold some dates I want to remember and highlight. 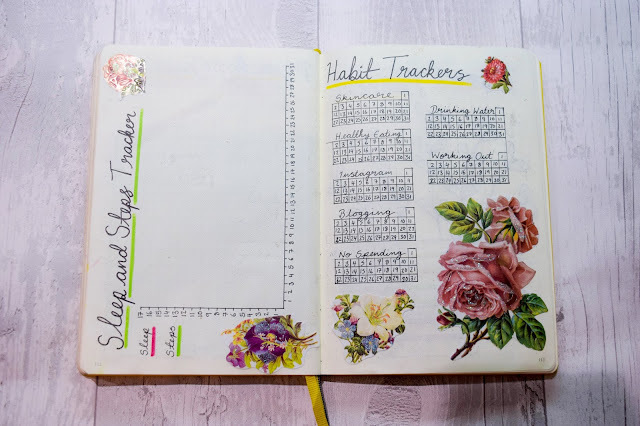 Learning from my mistakes, I've changed my habit tracker, sleep tracker and steps tracker a little bit. I really didn't get on with the logging the time I went to bed and the time I got up last month for my sleep tracker so instead I'm going to focus on hours of sleep according to Fitbit again. That worked and I shouldn't have changed it. 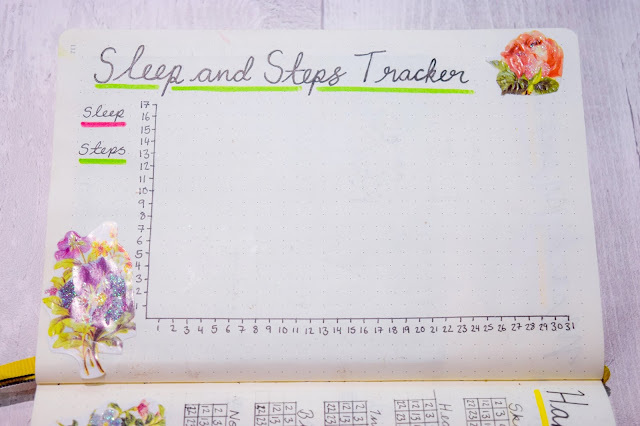 I'm still toying with the idea of recording this month's sleep and steps like a bar graph but I think I'll stick to the line graph because it'll be best to help track a trend in sleep patterns and steps. I also find that they sit hand in hand sometimes so I like to see if there's a trend between the steps I take and the amount of sleep I have. 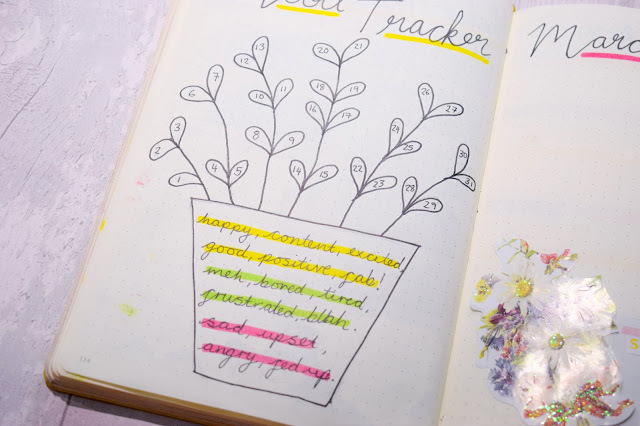 I've also decided to see if I can tracker my other things on individual trackers and all on one page. 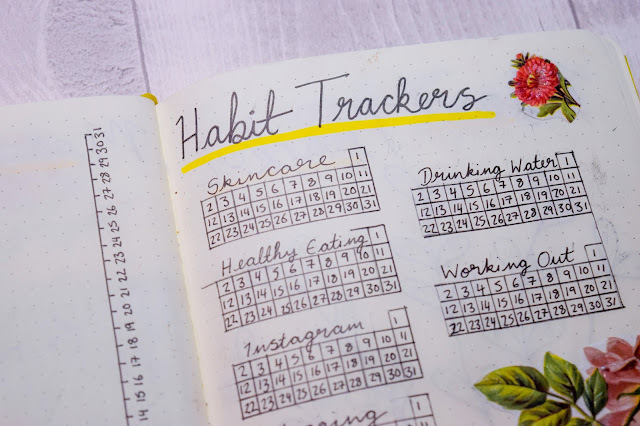 I barely tracked anything last month because it was in my weeks and actually, I found that I was more accountable for my habits when they're all in one place. It helps keep my mind on what I need to do and conscious of my choices. I made quite a few mistakes on that page but it didn't ruin it too much so I don't mind. It can't always be perfect! 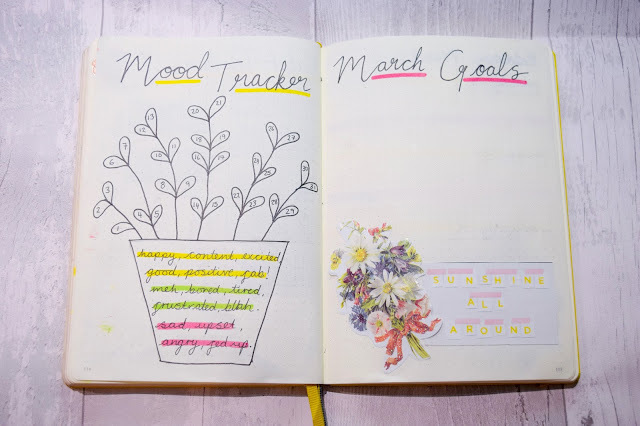 Next I have my mood tracker which I've decided to do differently again. This time, I'm going to trial three colours that are totally different to colour the picture of the plant. 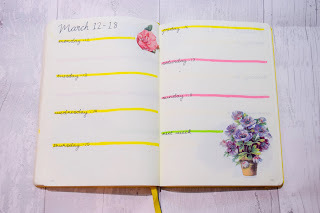 I added the days of the month to the leaves and wrote a variety of different moods in the flower pot highlighted with the colour code. I'm hoping this will help me track my moods with a bit more accuracy and less confusion about which colours mean what. 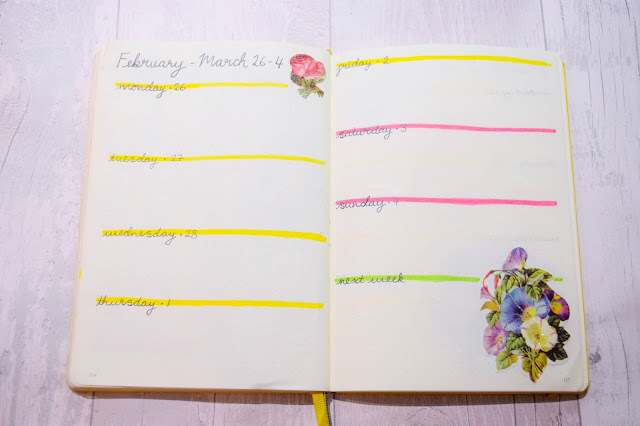 I've also added a March Goals page too. 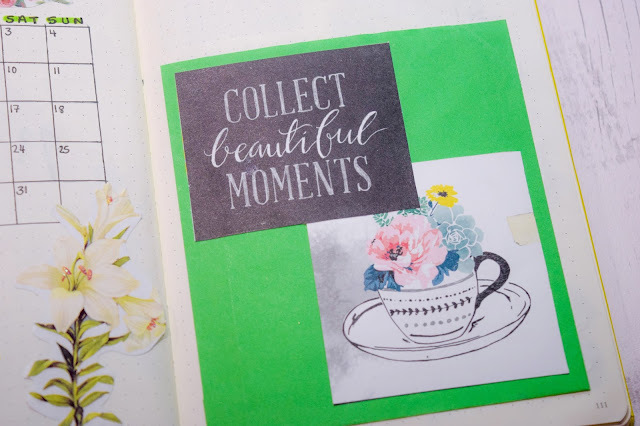 I liked having a goals page to look at and I kind of missed having that last month so I thought I would make one again this month to be more accountable for what I want to achieve. 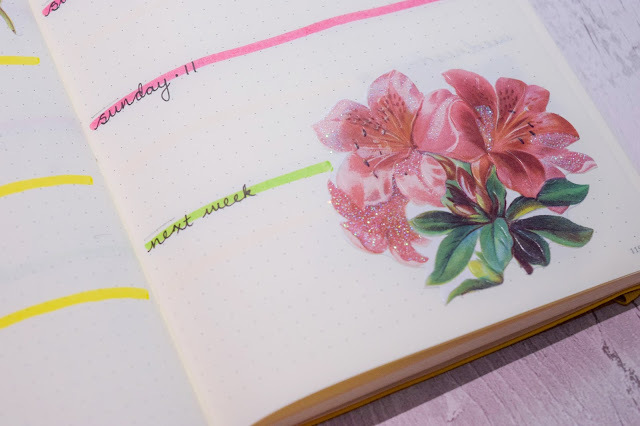 My weekly spreads have returned to being simple and spacious. 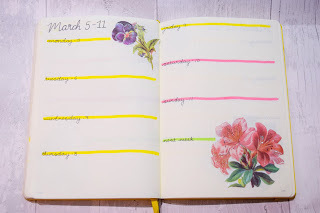 This month I wasn't very inspired by many weekly spreads and so I stuck with one I knew. 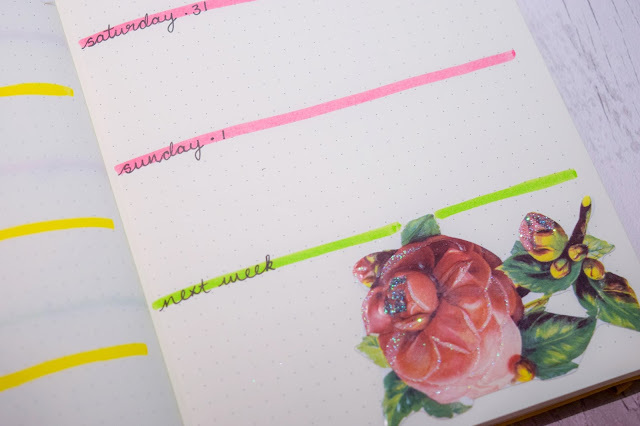 I colour coded the weekdays and weekends and also the section for next week which I found really useful last month. 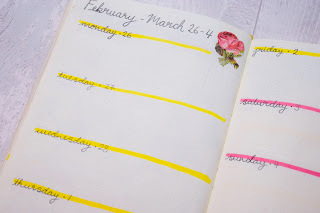 It helped me plan ahead and keep track of things a bit better. And gave me an equal amount of boxes too which pleases me! Each week I placed a different floral arrangement based on what floral cut outs I had left. I always put one up the left's top right hand side of the page and the right's bottom right hand side too. I think it looks nice like that and made sure I kept the space where I needed it. 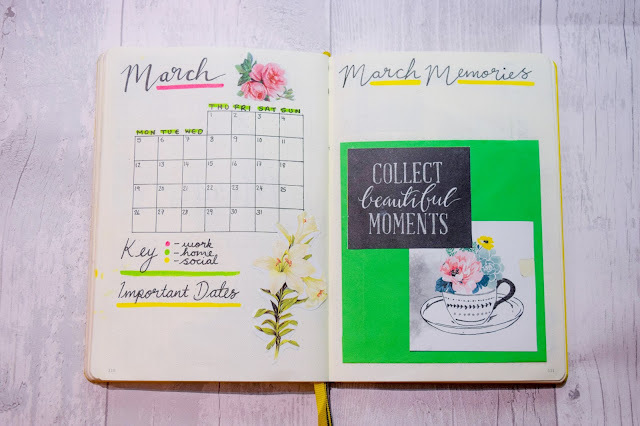 I do wish I drew something for March but I truly just didn't have the time for it, so this was my fun and creative alternative. Uniball Uni Pin Fineliners in 0.1, 0.2, 0.3, 0.5 and 0.8. Crayola Supertips in light green, pink and yellow. Floral cut outs from Tiger. Floral squares and quotes from Hobbycraft. Next time I want to explore some drawing again, maybe something a bit more minimalist... I'm just thinking out loud here. 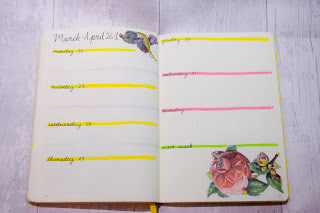 I do have some fun washi tapes I want to use and I know I want an animal theme to represent spring for April. 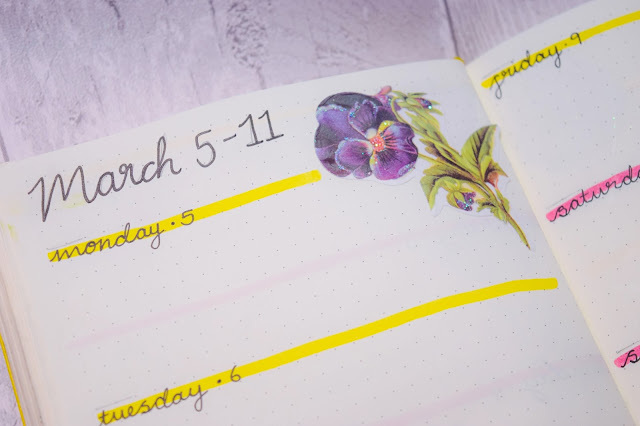 We'll see what happens, but for now, I get to appreciate the month of March and it's floral theme. What do you think of this theme? Do you like it or do you prefer it drawn like last month? I'd love to know what you think, simply because it's very different to what I've done before!